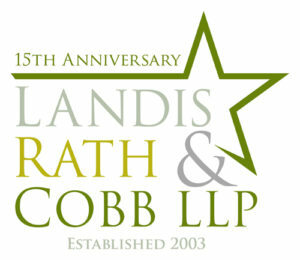 Wilmington, DE (November 7, 2018): Landis Rath & Cobb LLP is celebrating its 15th Anniversary by supporting its community through monetary support and volunteer time donated to Delaware charities selected by firm attorneys and staff. Located in downtown Wilmington since its inception, Landis Rath & Cobb, through its founding partners Adam Landis, Dan Rath and Rick Cobb, provides clients with sophisticated commercial bankruptcy and corporate litigation services outside the formal structure of the large firms. LRC and its partners are consistently rated among the top firms in its practices by Chambers USA, Best Lawyers in America, and U.S. News Best Law Firms. LRC is contributing $15,000 to Delaware’s Combined Campaign for Justice (CCJ). Protect disadvantaged people with consumer cases that involve exploitation and fraud. Nearly 25% of the three agencies’ budgets come from donations through the CCJ. Over 12,000 clients (5,000+ cases) are helped each year. A CCJ investment study last year shows that for every dollar invested in legal aid, $7 is returned to our community.